Last week, we focused on beacon technology at the NFL’s Super Bowl Blvd event hosted in midtown Manhattan. This week, in part two of our series, we take a look at the event’s NFC experience and highlight another missed opportunity for mobile engagement. In addition to beacons, we wanted to see firsthand how the NFC technology was being used. We registered online and received a QR Code and instructions on how obtain a badge at the event. Once we arrived at Super Bowl Blvd, we had to stand in a long, slow moving line to receive our badges. The tablet used to scan the codes wasn’t functioning properly, which caused the ambassador to enter all information by hand. After receiving our NFC enabled badges, we headed to the GMC attraction to see what content we could collect. We found a kiosk with the call to action – “scan here to win a car!” so we tried using our NFC badge and got a “thank you for participating” reply. This led us to another line, where we received a second NFC “badge” in the form of a wristband. Then we were instructed to visit three vehicles with scanning stations, which we did, only to find out we weren’t the lucky winners. So to recap, we missed the marketing, the experience, and didn’t win anything. The ambassadors were under trained. Having two NFC tags (NFL and GM) that generated the exact same data was inefficient and wasteful. The kiosks to be scanned had no call to action or instructions on how to use them. There was no apparent incentive for most the kiosks (except for the GM “win a car”). In our final example of missed mobile engagement at Super Bowl Blvd, let’s highlight this official pocket-sized guide. 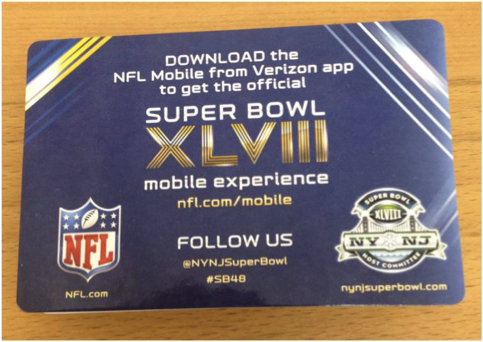 Note the call to action: “Download the NFL Mobile from Verizon app to get the official Super Bowl XLVII mobile experience”. It then lists a URL you can access to download the app. Really? This is New York in mid-winter! Would most fans stop and take their gloves off long enough to open a smartphone browser, type in each character of the URL, wait for the web page to appear, and then click the icon of their respective OS to begin downloading the app? The official guide calls this is a mobile experience, but it sounds more like a mobile scavenger hunt. Mobile engagement would have given fans access to the app in a New York minute. By including a QR Code with OS Detection next to the call of action, the guide would have provided that instant access to the app with a simple scan followed by one touch on the download screen. That’s pretty quick – even faster than the record-setting first score in this year’s Super Bowl, occurring just 12 seconds into the game. Similar to this year’s Super Bowl that ended in lopsided score, the mobile marketing activities surrounding the big event included many missed opportunities. As you can see from these examples, when your game place includes QR Codes, or any mobile trigger, it should include a very well thought out call to action, and experience – one that creates a winning strategy by delivering quick, relevant customer connections and tracking of the effectiveness of every play. If you have any questions on how ScanLife can implement the solutions mentioned here and beyond, please do not hesitate to contact us us at info@scanlife.com.